I just had my 20th birthday last week and before I stepped into this new decade of my life I had the privilege to accompany my Uncle to a small town in Gujarat named Bhavnagar. It was just a one-day trip in the lap of luxury. We travelled both ways by flight, were accommodated in a swanky hotel and drove around the entire town in an air-conditioned car. All of this has come so easily to me. I never thought of it or valued it in this sense ever before. In the hustle bustle of life we are so pre occupied meeting our day to day targets listed on the checklist that we never ponder upon some vital realities of life. Coming back to my Gujarat trip, the day proceeded well. We had a sumptuous breakfast in the flight and then visited a couple of ethnic temples in the city and went about shopping in the market. After all I had my summer holidays and the basic agenda was to have fun for a day! One of my Uncle’s friends invited us for lunch to his place. He belonged to one of the elite class people in the town with a bungalow of his own and servants at his service. Now whatever happens, the food blogger in me can somehow never perish! The simple Gujarati meal at his abode was finger licking! The Shrikhand that his daughter in law had made was just so flawless and fresh. And the secret was they had four cows and a buffalo in their backyard, which gave fresh milk daily! Amazing isn’t it? But we simply can’t imagine that back here in Mumbai. So, till now my illation of ‘a merry making’ trip was upheld. Soon after the lunch we were back in the car and ready to visit this place named ‘Anand Vatika’. I put on my sunglasses to save my eyes from the scorching heat of the noon Sun. And that very moment I thought that it was time now for me to replace my sunglasses with a pair of new ones! With this thought I got off the car and entered the premises of Anand Vatika. Anand Vatika is a place where girls from lower middle class families were taught the art of stitching and sewing to help them make their ends meet. We entered into the small classroom and spoke to their teacher. My Uncle, being a native of Bhavnagar and generous as he is wanted to help a few girls buy sewing machines for themselves after they are done with the course. Their teacher told us that the average income of their families was Rs. 4,000! Can you imagine running a home of three to four to even five persons with that meager sum! How on earth would they be able to ever afford a sewing machine! The classes charged them a sum of Rs. 100 for the entire course, which is pretty nominal but what after that? Even when they have scope of earning some money they cannot as the initial investment in the machine is too high. As the teacher apprised us of the details of their course and what kind of sewing machines would be apt for the girls to earn a decent livelihood I could see the girls gaping at us with some amount of hope in their eyes. I couldn’t really make eye contact with them. Just a few minutes ago all I could think of was to buy new Sunglasses for myself, but now I feel it’s time to get those Sunglasses off my eyes and face the harsh reality of the world! Soon after that I had another experience that metamorphosed my mindset to a great extent. We visited this old age home in Bhavnagar that had won the Award for ‘The Best Old Age Home’ in India. My Uncle had adopted a few rooms there and we just wanted to visit the same to see if all our resources were put to the best use. I had visited an Old Age Home back in school but with little retrospection on the same. Socially, it is not a very good thing to have such homes in Indian Society as we have always been taught to respect our elders and to live with our parents for as long as they are alive. But times are changing now, there are childless couples, there are elders who have children abroad and they do not wish to dislocate, there are also a few extreme cases where the son or the daughter is not willing to live with his or her parents and many other cases. The trustees of the Home took us around and as we perambulated around the place there were many of these elderly who joined their hands to greet us in the traditional Indian way, Namaste! They lived in rooms on a twin sharing basis, they had fixed meal timings and a dining hall to accommodate them all, they had a television viewing hall and a prayer hall. So, the Old Age Home made all attempts to make the evening of their lives as comfortable and blissful as possible. But can anything substitute the happiness of living with one’s own family and one’s own children and grandchildren? I don’t quite think so… I have lived with my grandparents and I have never though of shifting to a new place without them neither have my parents ever dreamt of it! I could see my own grandparents in each one of them who sat on the benches on the ground and in their balconies and indulged in colloquy. One really memorable thing here was that we met an old granny who was a 102 years old! Just imagine the world she must have seen right from both the World Wars to the Independence of India to the rise of Modi Sarkar! We tried talking to her and discovered that she had a weak eyesight but was pretty alert and could converse well. We then sought her blessings and made way to the kitchen area of this place. Apart from preparing food for the inmates, this place also had a tiffin service for all the elderly in and around the town who could not cook for themselves. All in all this place served 1,000+ old people, 3 meals a day 365x7! Pretty astounding isn’t it? Well, so this is the reason why I say there is more to Cherish than to Relish. But yeah, there is a lot to Relish here as well! We had dinner at this place called Rocks and Logs which had a wooden décor with paintings from Bollywood and photo frames from Hollywood. It had an outdoor, indoor air-conditioned and an al fresco terrace top seating! Difficult to imagine such a place in a small town in Gujarat, eh! We opted for the ‘Wonder Dinner’ option which served us a Soup of our Choice, An appetizer of our choice, Rotis, 2 Sabzis of our Choice, Dal, Rice and a small scoop of ice cream just for Rs. 200! The food wasn’t great but I was just too overwhelmed to find such a setting in Bhavnagar so I didn’t really mind. Post that we visited this roadside shanty there to beat the Summer heat with some Pyaali. It was a concoction of Crushed Ice, Ice Cream and some yummy toppings! 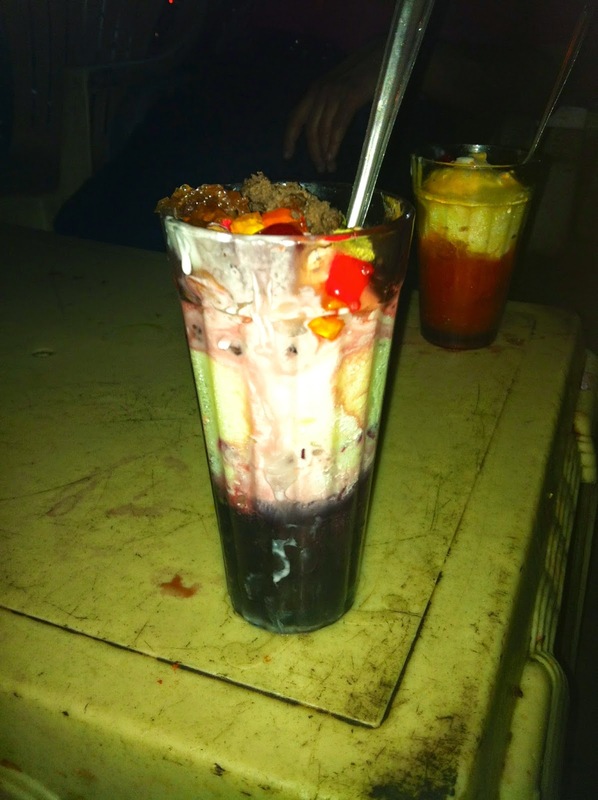 Such cool ice cream concoctions are very popular in Gujarat! THE PAINTING WITH BOLLYWOOD STARS COOKING AND SERVING- WHAT A LUXURY! Thus ended my day and the very next day we took a flight back to Mumbai and were home. I don’t have much to say now. But all I can deduce is that I can now make some sense of this dialogue between my Aunt and my Uncle! When my Aunt asked my Uncle what he wanted for his 60thbirthday, he replied that if I can be of some help to anybody and can actually render a helping hand to the needy, that will be my biggest birthday gift! It seems like your every post is intended to educate readers on eating unheard delicacies. The result is not just a blog, but a collection of yummy food experiences. It is a delightful experience to eat at Gujarati restaurants. One of the most popular Gujarati foods I prefer hogging is undhiu. Learning about Pyaali has excited me, because it offers a way to cool off "Summer heat". Wondering how Yum Yum Pyaali will taste after a plate of Chindian Manchurian. Buurppp!! Hahahah yes you must taste PYaali if you ever visit Gujarat!